CooksRecipes has quality, kitchen-tested recipes for bacon and prosciutto dishes that you can count on for successful deliciousness. 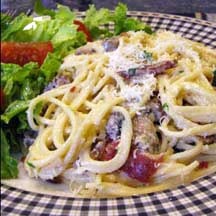 This quick and fabulous dish makes a great "busy day" entrée — but there are some rules to follow to ensure a delectable creamy sauce coats the pasta. 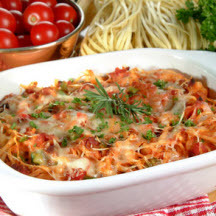 Here's an unusual tomato sauce that will pleasantly surprise your family. The smoky aroma of cooking bacon will call everyone to the kitchen and have them asking for more. 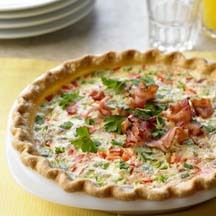 Flavorful and easy to put together, this tart works well for a brunch buffet or as a light supper.